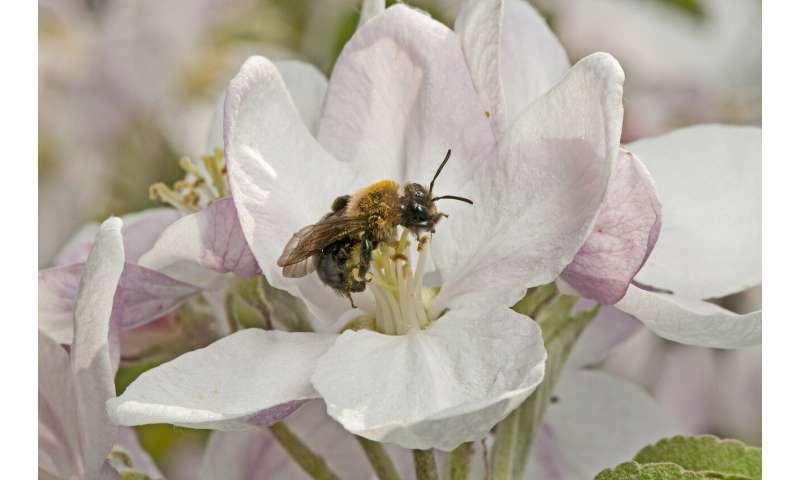 Apple orchards surrounded by agricultural lands are visited by a less diverse collection of bee species than orchards surrounded by natural habitats, according to a new Cornell University-led study, published in the journal Science. The researchers examined 10 years of data from 27 New York state apple orchards. The study accounted for the types of landscapes that surround these orchards, measured apple production and surveyed the species of bees that visited each orchard. "Orchards that have bee communities that are more closely related to each other did worse in terms of their fruit production, and the communities that are more broad across the phylogeny did much better," said Heather Grab, Ph.D., the paper's first author and a postdoctoral researcher in the lab of Katja Poveda, associate professor of entomology and a co-author of the study. Brian Danforth, professor of entomology, is a senior author of the study.